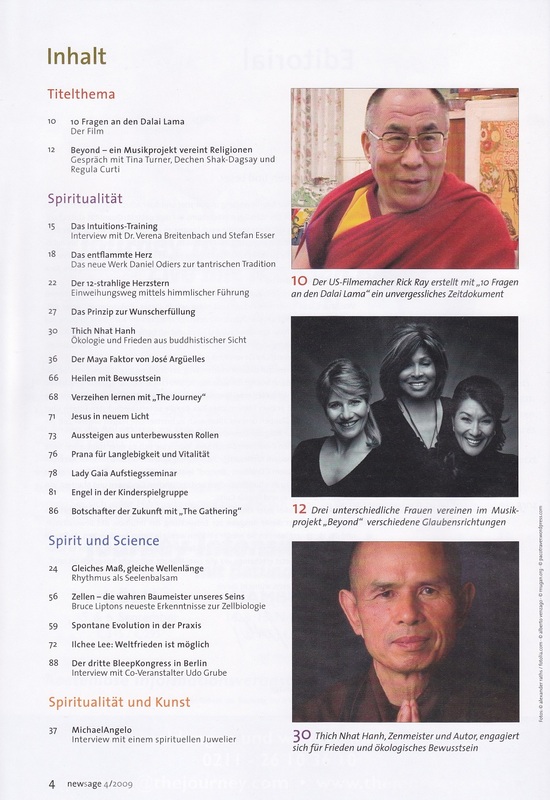 Tina Turner featured on the cover of the September/October 2009 issue of the German spiritual magazine Newsage. 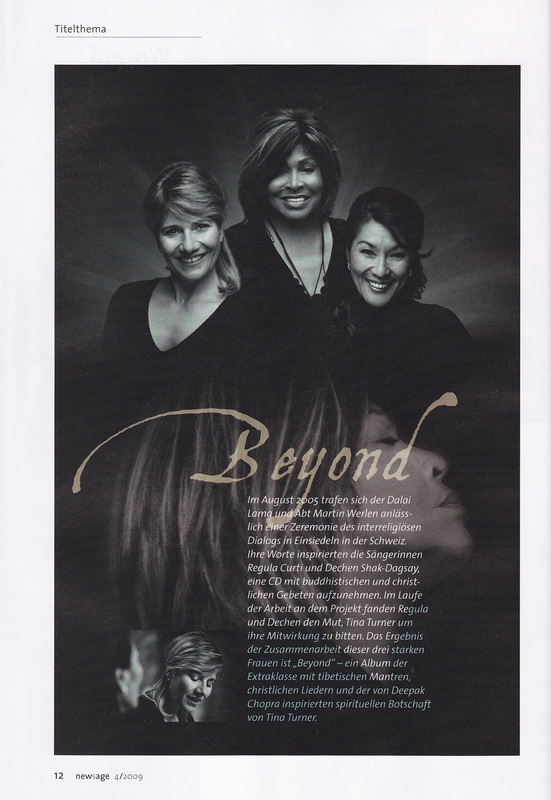 Inside the magazine is a short article on the first Beyond album with Regula Curti and Dechen Shak-Dagsay. This was Tina’s first collaboration on a spiritual album, and the article features some interesting information on how this project came about! 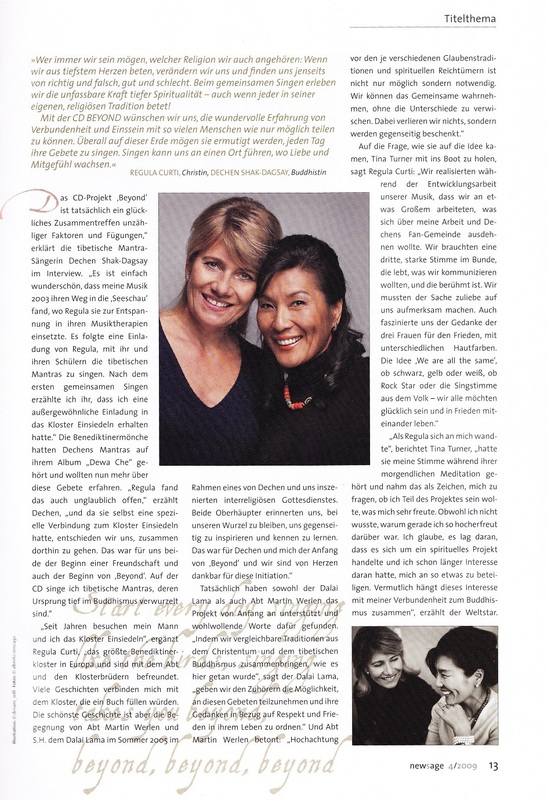 Continue reading to see the full article (in German) and an English translation. Thank you Michael for providing these scans! Wherever we are, no matter which religion we have: when we pray from the depths of our heart, we change and find us beyond right or wrong, good or bad. During collective singing we experience the incredible power of deep spirituality – even when each person prays from their own religious tradition! With the CD Beyond, we wish to share this experience of connection and ‘being one’ with as many people as possible. To encourage them, all around the world, to pray every day. Singing can take you to the place, where love and compassion grow. “For years, my husband and I have visited the monastery Einsiedeln,” adds Regula Curti, “the biggest Benedict monastery in Europe, and we are friends with the abbot and the monks. Many histories connect me with the monastery, which could fill a book. The most beautiful story, however, is the meeting between Abbot Martin Werlen and His Holiness the Dalai Lama in the summer of 2005, for the interreligious service, conceived by Dechen and me. Both religious leaders reminded us to stay with our roots, to mutually inspire and get to know one another. For Dechen and me, this was the start of ‘Beyond’ and we are thankful with all our hearts for this initiation. Will this play be coming to the United States? I think you are referring to the Soul Sister musical? So far, I have not heard any reports of this show going to other places. Desde que me enteré de ese proyecto, me pareció muy bueno. That’s sweet! Thanks a lot! No doubt an inspiring project. It’s nice to notice how the fit so well, the 3 belief systems and the 3 women. I think this a very well balanced project, on every level. Thank you guys for letting us know how it started and developed. You’re welcome, glad to hear you found it interesting! THIS IS A PROJECT REALLY GREAT! THANK YOU! I purchased this album recently. I LOVE it!! Being brought up christian and a practicing Buddhist now, it made me really take notice. The songs and voices are so beautifully blended. If you can find a copy I recommend this to anyone. Nam-myoho-renge-kyo!!! Reblogged this on The Tina Turner Blog.